The eONE-SIXTY 900, available in stunning red is the younger brother of the highly acclaimed 900E, setting the standard for a true Shimano thoroughbred. Totally Shimano in nature, the 900 like all Merida’s in this series sport a Shimano motor, 500Wh battery and drivetrain. Notably, leading eMTB magazine ‘E-Mountainbike’ declared the eONE-SIXTY as having “brilliant and cohesive spec” a “stylish image” and comes at a “great price“. Praise indeed for what is a truly awesome machine. First impressions are all about the look of the bike. Perfect geometry. Perfect lines. A great set of components take the eONE-SIXTY to dizzy heights. 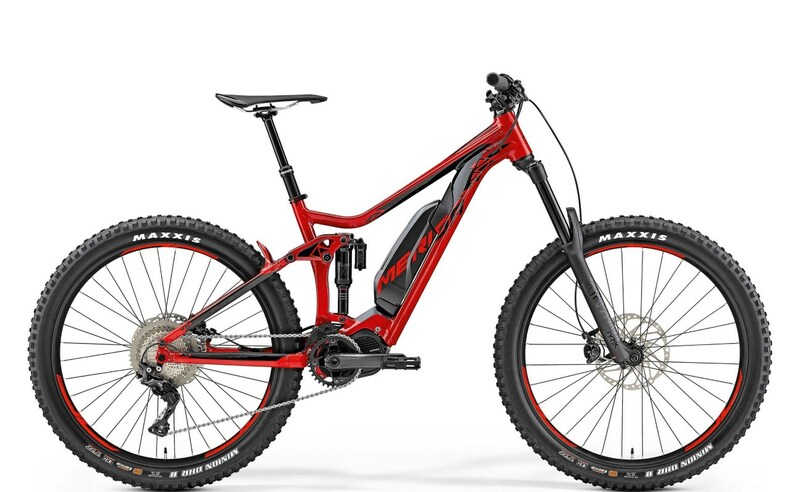 Designed for full off road, this gem of an eMTB provides serious performance. Powered by the new Shimano E8000 engine, the eONE-SIXTY 900 delivers extraordinary performance. Light and responsive, the E8000 marks a new era for eMTBs. Merida refer to their frames as having a ‘casting motorbracket’. This allows a more integrated look as well as improved motor performance. Additionally, frame material is triple butted aluminium alloy and is extremely light and durable. Manufacturing ensures an optimised stiffness-to-weight ratio. A huge 500Wh battery ensures long rides, and fits seamlessly into the frame. The RockShox Lyrik RC 160mm forks are ultra responsive and highly capable. As a result, they’ll gobble up almost anything thrown in front of them. The ‘Boost’ thru axle widens the hub spacing by 6mm resulting in a flatter spoke angle. Wheels are stiffer and stronger. Chain stay length is shorter for greater agility. Rear suspension is provided via a RockShox Super Deluxe R, and delivers ultimate compensation whenever required. A tapered headtube ensures superb stiffness and precise steering. Gearing on the eONE-SIXTY 900 is slick. A Shimano XT M8000 Shadow Plus and 11-speed 11-46T cassette work in perfect harmony. Wheels are tough, stable and reliable. Maxxis DHR II 2.8″ Plus tyres adorn a nice set of Merida’s own Expert TP rims. Consequently, the result is high strength and endurance. DT Swiss DT350 boost hubs finish off a high performing wheelset. Braking is highly effective, thanks to the Shimano XT hydraulic disc brakes. A set of 203mm rotors are more than up to the job. Decisive and responsive. Furthermore, the aesthetics of the eONE-SIXTY 900 are enviable. Internal cable routing has been perfected thanks to Merida’s ‘Smart Entry’ approach. Cables are routed internally. However, by clamping under tension as they are eliminates cable rattle and noise even when the going gets tough. Special inlets and outlets ensure a clean and uncluttered look. For even greater strength and resilience, welding comprises a two-stage process. A second weld evens the connecting welding seam. This produces a ‘smooth-weld’ appearance for even more astonishing looks. Tricky downhills are no problem thanks to a Merida Expert TR dropper. Actuation is highly responsive, and easily engaged on the bars. The eONE-SIXTY 900 is a smart performer. For those seeking a high quality eMTB with a very natural feel, Merida have done a fantastic job!